We loved our stay! The family were very friendly and made us feel very welcome - we celebrated birthday with Arif, got a tour around the neighborhood with Salim, and felt somehow that we got to be a part of their family. 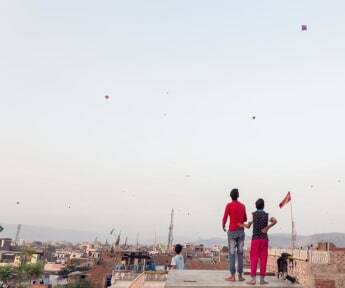 The rooftop is great - functions as a meeting spot for other travellers as well and you see kids flying kites. Good location: it's not in a touristy area with people trying to sell you stuff, but still within walking distance to pink city and monkey temple. On-site family is friendly and hospitable, creating a really warm and welcoming atmosphere. They really understand what travelers appreciate in accommodations and do their best to provide. Really professional from start to finish, tying to improve their services to make Chalo the best hostel in India. Really great to see an eco-conscious operation in India. Welcome letter is key to all the info you need to make your arrival easy. Entire hostel is very clean. Hot water is hot. Food is very tasty. Not for the faint of heart but an unforgettable, authentic hostel experience. If you are looking for an immersive time in which you are among the back streets of India, this is the spot. The hostel is a bit difficult to find but the community was helpful in getting us there. The children literally led us by hand. Pro tip: if you order a car, make sure to order it from the Main Street because the streets are too small for 4-wheeled vehicles or ask Anas (THE MAN) for help. Amazing employee! The best place we stayed during our Indian holiday! Loved everything about it. The owner is super friendly and helps with whatever you need. The value for money is perfect, its a hideaway from the city and we were always looking forward to get back there. AMAZING! Hands down the best hostel I have stayed in India through months of travel. You arrive as a backpacker and leave as a friend. Nadim and the family are extremely welcoming and will help with anything you need during the stay and beyond. The location is close to pink city, there is always a hot shower, the rooms are spacious, beds are comfortable, there are a few chill out areas including amazing roof terrace with great views of the neighbourhood. The food is homemade, cheap and delicious. All I have to say is wow. This hostel is absolutely amazing. Chalo Eco Hostel is a family run business which you don't find very often, and it was the main reason for my stay. The family were very warm and welcoming. The rooms were also great, and I got to know many fellow travellers like myself :) thank you for having me, Nadim! Visiting this hostel is definitely a must if you're in Jaipur! Very small and personable hostel with lots of lovely staff. Family run and their children are gorgeous and very well behaved. Amazing rooftop area to relax and watch the cities children fly their kites! Located with the city walls meant it was walking distance to most of the major sites. Finally but perhaps most importantly they support a local school with 20% of the profits from the hostel going there, what a great idea!! A lovely clean eco hostel with friendly staff. A great place to chill out and relax from the craziness of Jaipur. The food is really nice too and the beds are comfy, anything you need the staff will try help you with. My second time coming back here, Would totally recommend! We really enjoyed staying at Chalo. The family were so helpful and friendly. Breakfast was very tasty and included in the price! The hostel is quite hard to find and there isn’t much to do in the area. 40 minute walk from the pink city. The room was very stuffy at night. A standing fan would have been nice. Good small hostel to stay in if you want to have a quiet and peaceful time with a lovely local family.